Want to know my secret to losing 80 pounds? 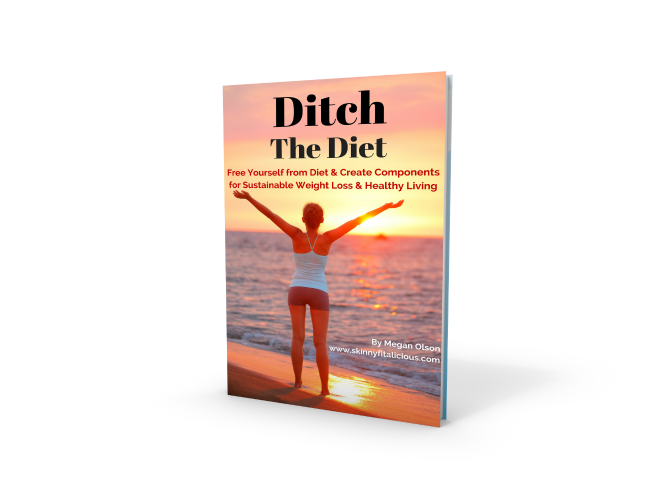 Find out how I ditched dieting and transformed my mind, body and soul in this 28 page eBook packed with tips for getting started, healthy eating, meal planning, calorie counting, fitness activity, reducing sugar cravings and overcoming the mental side of weight loss as well as my favorite low calorie recipes. FREE yourself from diet forever to create the components you need for sustainable weight loss and healthy living. Start now and don't put your health on hold a second longer! "Imagine a new you with more energy, drive, focus and passion. A chilled out, leaned out, cleaned out version of you. A you that feels good, empowered and ready to elevate the world from mediocrity to greatness." "I spent the majority of my life trying to please others (which I mostly failed at), taking the safe route, not taking any risks and not living life. I was tired of being unhappy until one day, I finally realized it was my choice to live in that unhappy swamp of self pity." "We always torture ourselves into thinking weight loss and healthy living is a form of punishment but it's not. It’s a way of life. Physical changes are just a freebie that come with it."